Visit jewelosco.com/careers and land on to Jewel Osco careers center to know more about its employment positions. 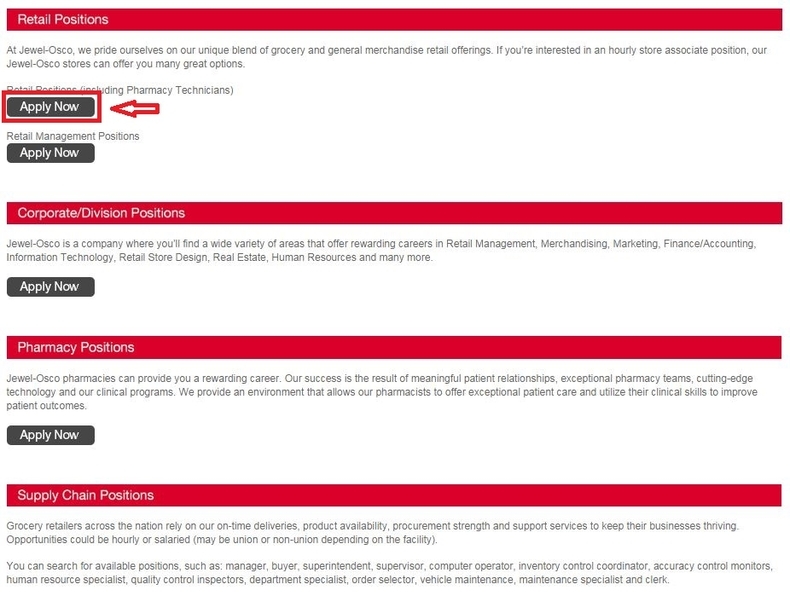 Jewel Osco provides different positions in different areas. 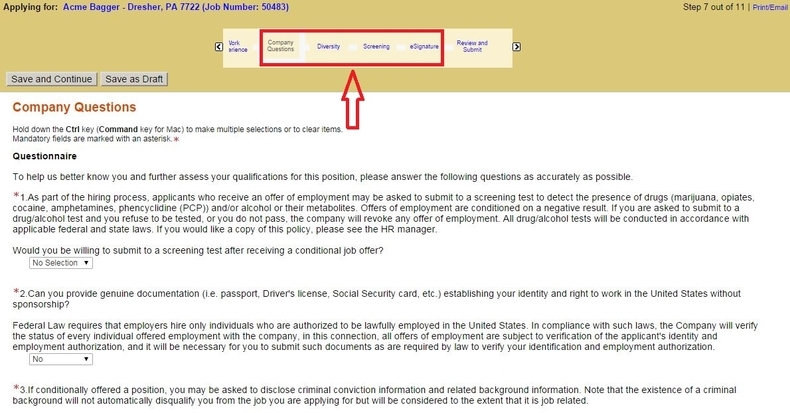 You can choose the area you are fond of and click "Apply Now" to start your job search. Here we choose to search opportunities in retail area. 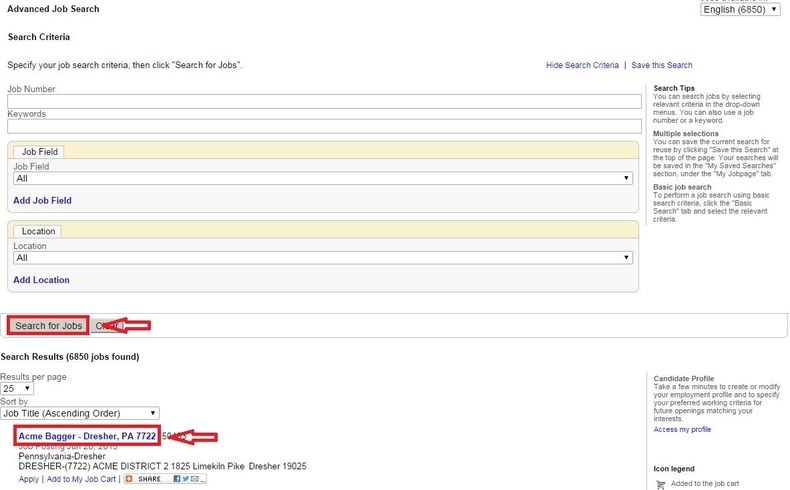 Use the search criteria to quickly search job opportunities or browse the job openings list and then select one for you. You can click the title of your interested position to move on. Here we choose the first position on the list to set you an example. 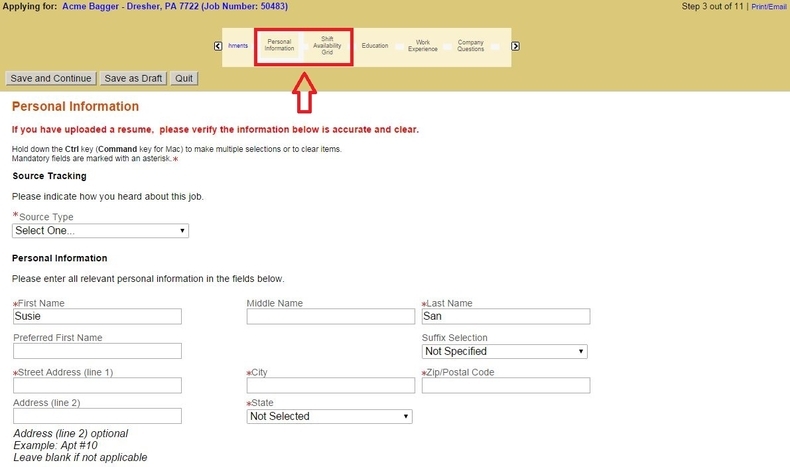 View the details of the position and then click the button "Apply Online" to start your application. You need to carefully read the job details like responsibilities, skills, requirements etc. and think about if you are qualified to apply for the position. Once you decide to apply for a position, just click "Apply Online" to start. Login in with your account or click the button to create a new account. For returning users, you need to enter your user name and password to login. If you are a first time user, just click "New User", accept the privacy agreement and follow instructions to create an account for you. 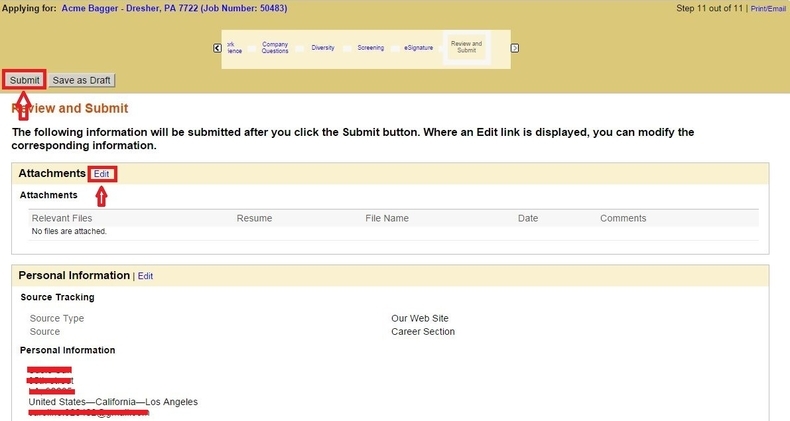 Select your resume or other file to upload and then click the button "Save and Continue" to proceed. 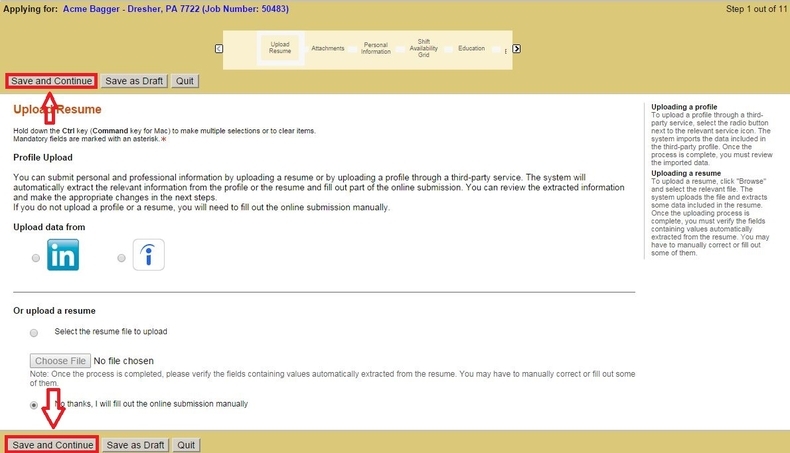 If you don't want to upload a resume, you can choose to fill out your online submission manually. Here we choose to fill out information manually. Mandatory fields are marked with an asterisk. Fill out your personal information like name, phone number, address etc. and then click "Save and Continue" to indicate your shift availability grid. Please notice that the mandatory fields are marked with asterisk. Provide information regarding your education and work experience. You need to list your educational experiences and work experiences starting from the most relevant one. Follow instructions to finish the rest steps like answering company questions, indicating your diversity, completing a questionnaire and leaving your eSignature etc. You need to compete the required fields in each step and then click the "Save and Continue" button to proceed to the next step. Review the information you have provided and click the button to submit your application. You can click "Edit" to modify the corresponding information if it's necessary. After you submit your application, the whole application process will be finished. You may click the link to view your submission or jobs matching your profile. 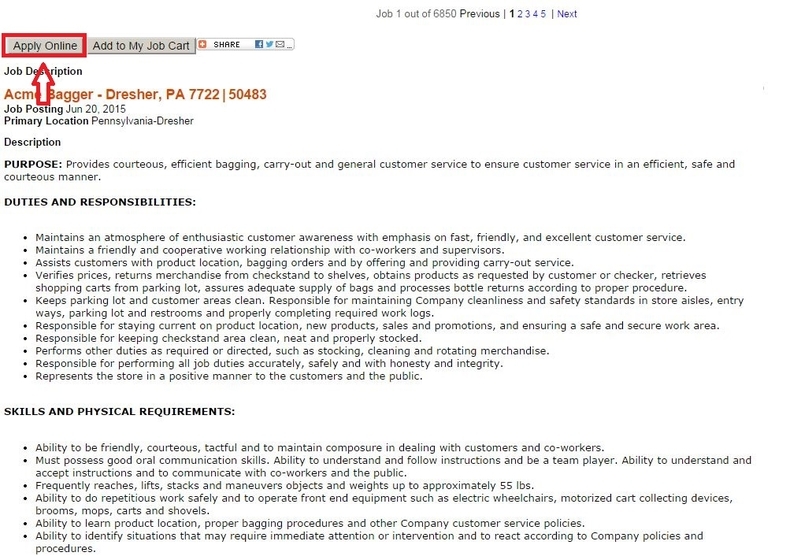 Click jewelosco.com/careers to apply for Jewel Osco jobs online.